Hmm...That sounds like a bad air leak, or a panel resonance perhaps one did not get enough glue in the joint. Something is not right. Investigation is in order. Good luck. The measurements look good. That's a smooth response from 30-150Hz with no smoothing or processing. Looks right. Were these taken outdoors? I'm not sure what to say about the noise. I don't recall anything like that from mine. All of the air noise I've encountered is from the ports at really high output near tuning. When airspeed gets high. The horn section has a lot more area and the airspeeds are a lot lower. I wouldn't expect anything like that especially at lower volumes. Could be an air leak, a loose panel, wire touching the cone, or a driver issue. Might be worth double checking that everything is sealed good and tight especially at the driver mounting area. I never put any material in the upper section of mine. Is it something that you hear with you ears close to the cab or something that is audible from 10+ feet away? Is this with the low pass filter in place? I finally got around to groundplane testing these drivers about 4 years after getting them. Results for a pair of them wired in series in the old DO cab are uploaded. K20 still couldn't quite get to the absolute limits. It doesn't like wanging everything it has into 1ohm per channel for some reason. Any discussion of the drivers or test results should go here please. Speculation is it might have been the not enough glue on the joint at the former. Me either...I got sidetracked back to working on content for the new website. If the Earthquake suspension design works well I'd consider the reduced depth a big advantage over most other PR's on the market using a driver frame. The VMP PR's used the TI frame down to the spider landing and then had a large stack of washers protruding from the back. Assuming a pair of PR's were mounted opposed you would want about 5" minimum between the nuts and washer stack on each PR to allow at least 2.5" incursion before contact. It ended up needing quite a bit of clearance and enclosure width. Quick work as usual...I imagine you'll be the first person to complete a Skram and fire it up. M_MS, FLH's do indeed have their excursion maximum at the low frequency knee. This often means that their output is limited in that area first as the driver runs out of excursion. It makes their frequency response and extension a little bit misleading if they will be driven hard. Most other alignments such as ported, TH, BP6, BP8, Skhorn style hybrid, passive radiator etc, etc. have an excursion minimum near the low frequency knee. 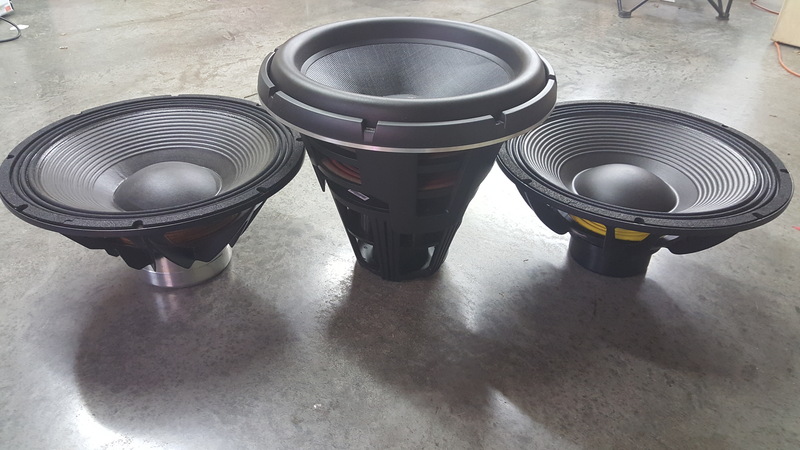 Other than the above sealed OB and IB subs have no excursion notch, ported has a single notch and higher order alignments like TH, FLH and BP6, etc have 2 or more excursion notches. Beyond this it cannot really be said that one has less excursion, or THD than another. It depends so heavily on the individual design, drivers used etc...There is no simple blanket answer to a very complex set of interactions. The absolute best way to learn this stuff is to download a program like HornResponse and start simulating different designs. Build, measure, listen, etc... I have no idea the context of "enclosure interaction" or the intended meaning. All drivers interact with their enclosures. I'd actually say larger horns cause more interaction if anything. The response is being modified more greatly than the drivers free air behavior not less. Excellent write up. Good looking sub. Did you build a pair? You mentioned having 4 of the PR's? As you mention there are some differences in PR based systems vs vented systems. PR's suffer from less compression until the suspension starts to tighten substantially. However once the suspension limits are approached there is eventually a hard limit. It's not that difficult to hit them near tuning with todays drivers. Vents will suffer compression earlier in most cases but will continue to produce more output despite increased noise and increasingly chaotic air flow. Vents are cheaper and more reliable (Less moving parts), PR's allow a more compact enclosure and tunings lower than practical with vents. PR's behave a bit differently below tuning as well. Ever seen PR's excursion go out of phase with each other below tuning? The Fs shift at higher excursions is also slightly different. Vents can shift a bit too but not as much as PR's from what I've seen. I used to have a set of 12", 15" and 18" VMP's. I eventually sold them all. I wish I still had them at times. Most of the PR's on the market lack the needed excursion to cope with todays drivers. The Earthquakes seem to be closer to what is needed. I never knew that they went with a modified second surround on the backside instead of spiders. Keeps the depth really shallow. Any concerns with cantilevering during operation? It's impossible to predict the distortion behavior. The measurements I took with the Ipal drivers looked really good. Your cab is slightly bigger so that should help but the drivers are different. Measurements for the win. 21SW152-4 models great in this cab. It's one of the smoother modeling drivers in it. All of the usual pro 21's should be a good match. 18Sound 21ID, 21NLW9601, B&C 21DS115, 21SW152, 21Ipal, RCF LF21N551 looks decent, Lavoce SAN214.50 and the new Eminence NSW6021-6. I'm hoping that it will be smooth up until 150Hz if needed. It should be. Actually I'm hoping it behaves similar to the Skhorn and is relatively smooth up until a bit past 200Hz allowing XO's well in excess of 120Hz if required and a predictable XO transition to the mains. Until I get finished cabs with drivers installed I won't know exactly but it should be close to the sims. As far as sound of the cabs I actually preferred the Skhorn over the Othorn slightly, Skhorn seems a little bit cleaner at high output (lower THD) with a bit more oomph in the 60-120Hz octave, but both are still really good for loud music playback. I'd expect this cab to sound extremely similar to the Skhorn and perhaps a bit better in a Skram pair vs single Skhorn situation. Again I don't have Skram's done yet but that's what I expect. Unfortunately I got rid of my last pair of Othorns a while back so I no longer have those on hand for direct comparison. A lot of people are happy with them though. Output and sensitivity between the 2 cabs isn't a whole lot different overall. Othorn is a larger cab, heavier cab that is 4" deeper, so it likely will have a bit more max output in the 25-35Hz area and a bit more sensitivity over that range too. HIL and all of that. The Skram will likely have a bit more from 35-70Hz or about that. This is with all of the Skram vents open. It is more flexible and can go deeper once the alternate vent tunings are factored in. Top end above 70Hz is a bit of a wash. When I say more output I mean in the neighborhood of a couple of dB or less while using the same drivers. Not huge differences. Once I get to test the real cabs I'll know for sure. I'd say it's more of a lateral move to something a bit different rather than an across the board improvement. Where you been Kyle? As Scott said it's basically an update to the cosmetics of the old inukes. I believe the guts have been confirmed to be nearly unchanged. There was some speculation that they worked on HF load invariance though. The new ones definitely look better. In my case it is definitely something inside the motor under the spiders. Driver in free-air. It's not really audible once in the cab. Eminence is replacing the woofer that ticks and want to diagnose the issue. The Lavoce driver exhibiting the same thing I haven't contacted them about yet. PDF Print added to the first post for download. I'm having trouble with the DXF print giving an error. I'll have to look at that later. You always do! When I go bigger I end up stuffing more drivers in the cab! The only 18 I've modeled is the Pro5100 TC Sounds, which looks good. Changing the baffle cutout for the 18" would be the only change needed to fit an 18. By the way. The reason I'm not posting the HR inputs is due to the way the vents behave. The vents are loaded into the corner and back wall which will increase their apparent length and tune like a physically longer vent. HR has no way of knowing this so the vent length HR input is longer than the physical vent length to hit what should be the correct tuning the cab will have with the amount of vent area. Doing this causes the vent resonance to be somewhat lower in frequency and more severe than it will be. In order to get the vent resonance in what should be the correct frequency range I shorten the vent length to the physical length, but this raises the tuning of the cab. To compensate for that in the sim I have adjusted the vent area down to hit the expected real tuning correctly. These are the sims shown. To further complicate things overall vent volume and area affects the amount of efficiency that the vents have. More volume and area= more gain. Also a single large circular vent has upper end resonance behaviors that are different than multiple smaller vents of the same area that are square in cross section. HR doesn't know this either. I saw this same type of behavior with the MAUL which loaded a huge vent right into the back wall of the cab and to a lesser extent the Skhorn. Anyway I'm interested to see what the vent resonance turns out like in the real cabs. It could end up with almost no effect on the response (hopefully) or it could create a large notch as low as 160Hz (WCS). As usual I think it will be in between. I'm going to wait till I have real data so I can adjust the HR inputs to reflect the vent behavior before posting the inputs. I looked into cutting some HDPE or similar. I left the skids on the longer dimensions because it should be a bit more stable. I'm still not entirely sure which way I will go for feet / stacking yet. It should fit no problem. There is still no availability of that driver here in the US. I see it available in a few shops across the Atlantic but I haven't seen anyone that actually has them yet. Seems like they've been advertising that driver for a long time now not to have stock. Simulation with the 21NTLW5000. Standard sim with factory specs is the black line and actually looks pretty good. Using the generic high LE function uglies up the response a lot (grey line). It doesn't load the vents as strongly as the more efficient drivers. I don't think it will behave like high LE graph though. Unfortunately there aren't any semi inductance specs available for the driver to do the more accurate sim. Hopefully someone will pull an impedance measurement from one and post those soon. I don't see myself doing many TH or FLH's in the future. FLH makes more sense for systems without size restrictions, looking to extract maximum from a single driver and those without the need to go very deep. I might employ it for 80-300Hz range or so in the future but it's doubtful I'd do a subwoofer. 30Hz extension is bare minimum for something I consider a "sub". FLH's can be bested in the lower register by smaller more output dense alignments. They can sound very good. TH's I've found that the limited bandwidth and limitations imposed by path length needs and folding options cause them to be difficult to design well. More importantly the harmonic resonances in the response are audible and can cause major issues with harmonic distortion and ringing. In order to keep this up out of the sub bandwidth, well damped and above the low pass filter it's difficult to get extension much lower than the Othorn IMHO. TH's are best with extension to the 30-40Hz range IMHO. When done right they can sound killer as well, but the driver is more exposed usually so they have a bit more operational noise than FLH's. Better driver cooling though. The hybrid BP's I've been doing can be smaller than TH's, much smaller than FLH's and can almost match the TH's output. They are still somewhat tricky to design well and package but easier than a TH and easier to build. The response can be made to lack the upper end response issues more easily. The driver is buried in the cab so mechanical and operational noises are diminished, which is a big deal to me, but the air exchange and cooling is a lot better than a FLH. They are a bit more tolerant of a wider range of drivers as well. The sound is definitely clean and visceral when done right. In summary I have heard excellent examples of all 3 sub types. I'm a big fan of burying the drivers in the cabinet. Reducing the direct operational noise of the drivers especially when operating at high excursion / high output scenarios makes a large difference to me. The tradeoff is it may be difficult to tell just how hard the driver is being worked.